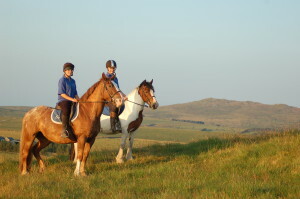 Horse Riding at Hallagenna, in the heart of Bodmin Moor, is really something rather special. It’s a unique combination of a variety of factors, which we think will give you a memorable riding experience of horse riding Cornwall. Bodmin Moor offers mile after mile of unspoilt, open moorland scenery right on our doorstep. First farmed over 4,000 years ago by Bronze Age settlers, Bodmin Moor is one of the last great unspoilt areas in the country. It’s prehistoric and medieval past has remained untouched by the passing centuries. Riding on the Moor can be both exciting and challenging – when first encountering the Moor you are at once struck by its great expanse and the freedom this affords. Riding the dramatic, granite tors on a clear day can give you a spectacular view of Cornwall from coast to hills. The Moor offers a beautiful display of green pastures, rugged distant coastlines and unrivalled flora and fauna. On a clear day, large cargo vessels can be seen passing along the North Cornwall Coast. Riding between the Tors and across the open commons, passing old settlements and stone circles, you get a real sense of space and tranquility. A sense of peace only broken by bird song or the occasional call of an animal grazing on the Moor. 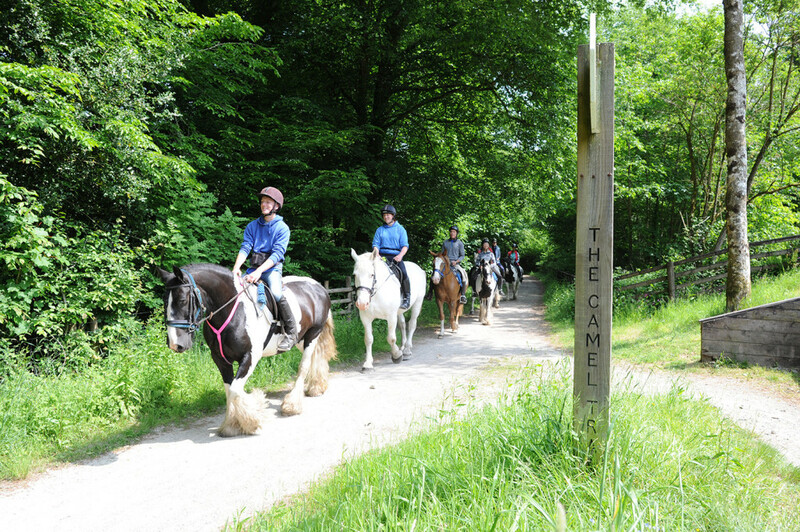 Riding through the woodland areas of the Moor, you experience intrigue as to what riding awaits you ahead – a gentle valley, a stream to cross, a rocky tor to climb or an open common for a gallop through this beautiful countryside. Riding Bodmin Moor, the breathtaking land of Tales and Legends, is a truly exhilarating experience, which can only be described as some of the best horse riding in the UK and Europe. We offer 1, 2 and 3-4 hour treks, and hacks. And for the more serious rider we offer up to 5 different trails up to 5 hours long. See our trail riding page for more details. Our characterful, experienced horses and ponies keen to explore the Moor at your pace, whilst our friendly and experienced staff can assist you, whether a beginner or experienced rider, for a truly memorable horseback riding holiday in England. Local riders Ask for information regarding local rider discounts and our frequent riders club. And we’ve even converted our old stables into smart, fully-equipped holiday cottages for those guests who can’t tear themselves away! Equestrian Holidays Cornwall – Available for weekly stays or shorter breaks out of season, our modern holiday cottages are an ideal base for exploring all that Cornwall has to offer. We look forward to welcoming you to Hallagenna. Please call us on 01208 851500 or email us to find out more.